2017+ Ford Fusion Sport 2.7L Charge Pipes [FusionHotPipes] - $550.00 : Eco Power Parts!, More Power for your Ecoboosted vehicle! These pipes, silicone hoses and clamps replace the factory piping from the throttle body to the intercooler and intercooler to the turbo with new aluminum pipes and 4 ply silicone hoses. Please choose factory BoV mounts to re-use your factory BoV in either recirc or vta modes. Please make sure to wash and blow out the pipes prior to installing it is possible there is machining oil and metal shavings in the pipes after manufacturing is completed. Powder coating blemishes on the end of the pipes due to machining oil will be covered by the silicone hoses and will not impact the functionality and/or appearance of the pipes. 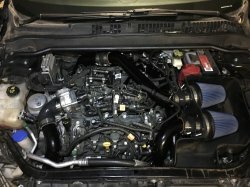 Charge pipe 90 degree 2.75” to 2.5” TB to IC hose will require trimming to fit your vehicle. The amount varies but we found 2 ¾” on the 2.5” side and 2.25” on the 2.75” with a spacer or 1.5” no spacer.